By now you know that my favorite appetizer combination is fruit + cheese. I mean, can you ever go wrong with the two? And bonus points for nuts. Fruit + cheese + nuts is the perfect trifecta for a bite that hits all the right flavor and texture notes. This appetizer formula doesn’t have to be limited to just fresh fruit. Fruit spreads and dried fruit go great with cheese, too. And they’re much easier to keep on hand in case of unexpected company. Of course, I’d love to make a beautiful cheese board with lots of different cheeses, fruits, and nuts any time I have guests, but sometimes that’s just not realistic. Sometimes you only have a little time and a couple ingredients on hand (or don’t want to buy any more than that). 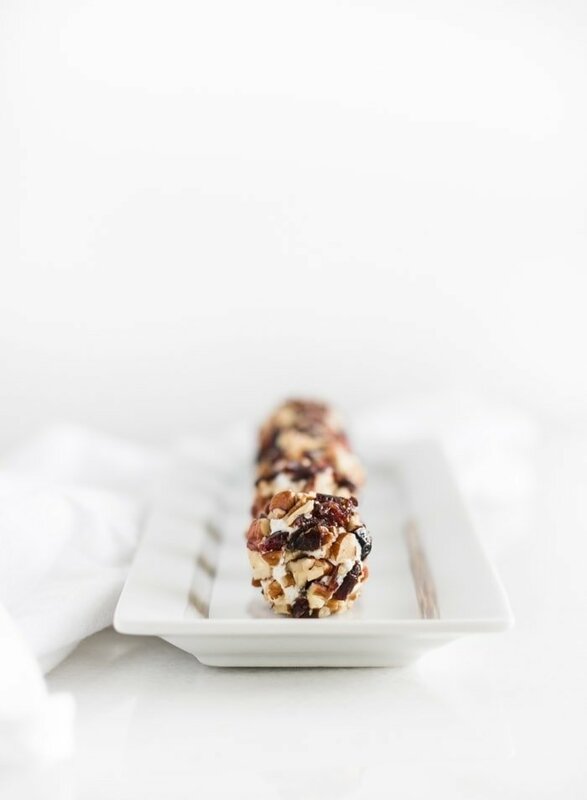 In which case, these cranberry pecan mini goat cheese balls are the perfect solution! They require only 3 ingredients, are super easy to make, and hit the mark for all the right components of a delicious holiday appetizer. 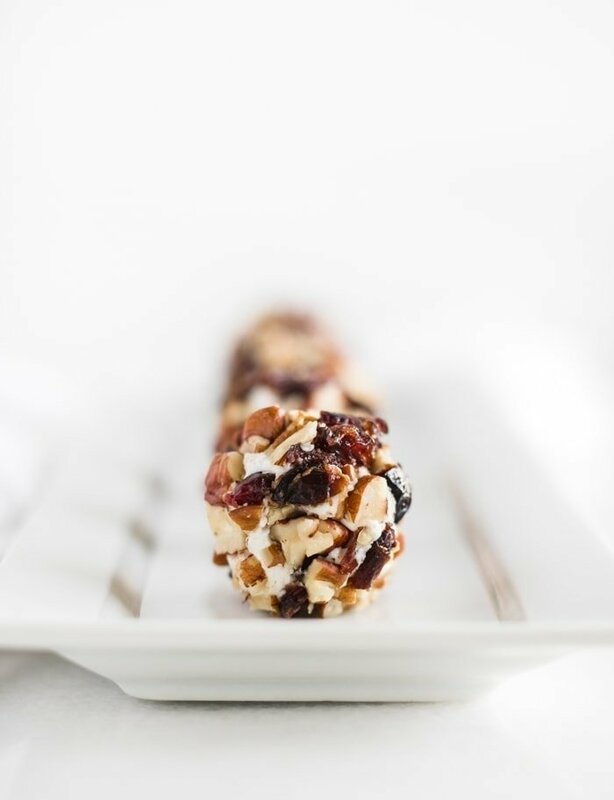 Simply roll some soft goat cheese into little bite-sized balls, and coat in chopped dried cranberries and toasted pecans. It’s such a tasty sweet and savory bite that you won’t be able to stop eating! 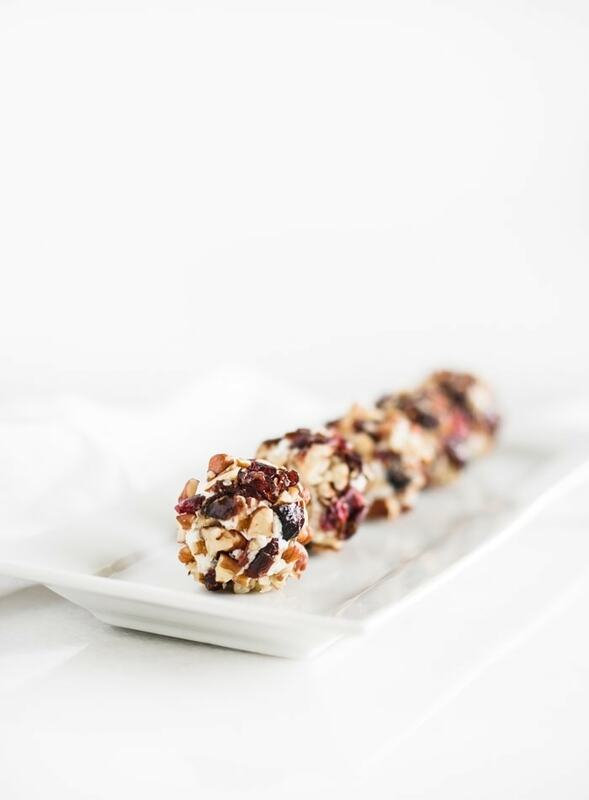 You can mix these mini goat cheese balls up with any combination of dried fruit and nuts that you prefer. I think cranberries are festive for holidays, but you can also use dried apricots, figs, blueberries, or cherries. And for different nuts, try walnuts, almonds, pistachios or even hazelnuts! The combinations are infinite. Enjoy! In a small skillet on medium heat or in an oven preheated to 350°F, toast pecans until lightly browned and fragrant. Careful not to burn them! Let cool before handling. Mix cranberries and pecans on a small plate. Using a teaspoon, shape goat cheese into balls. 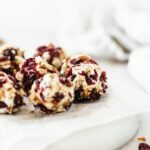 Roll each ball in the cranberry and pecan mixture. Store goat cheese balls in the refrigerator until ready to serve.